Home / Media / Press Releases / How Can Japanese Kaizen Lead to Development? The Global Development Network (GDN) is pleased to launch a new initiative with the Japan International Cooperation Agency (JICA) Research Institute to document how the Japanese managerial philosophy of Kaizen actually performs. Kaizen literally means change (kai) for good (zen), and encourages continuous learning and improvement. If adopted as a managerial guiding principle, Kaizen is said to lead to industrial growth and to development within both public and private sectors. As part of its development assistance, Kaizen has been introduced by JICA in several countries, such as Ethiopia, Tunisia, Brazil, and across Asia, Central America and Eastern Europe. 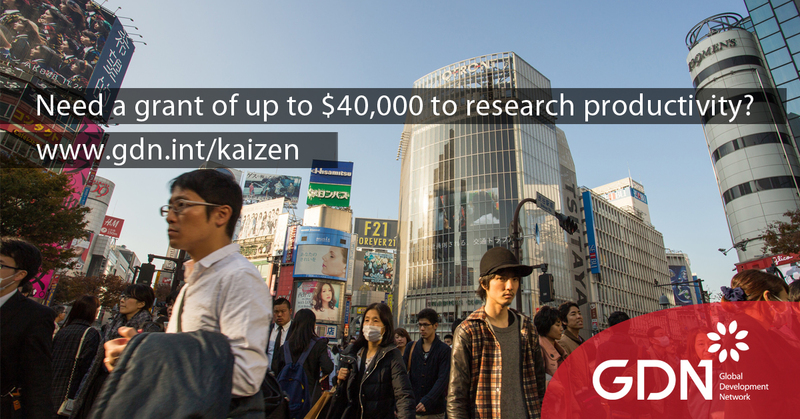 The new initiative will mobilize a series of empirical studies, conducted by local researchers in the developing world, to document and analyze the effectiveness of Kaizen. The two-year research initiative, involving 15 researchers and a budget of more than $500,000, comes at a time when the global economy continues to be uncertain, and slow to recover and when inclusive growth, employment and decent work for all have risen as first order challenges in developing countries. Results will feed policy discussions on managerial capacity and work systems, as well as on the social structures needed to boost economic growth. “Local researchers hold the key,” said Pierre Jacquet, President of GDN, “because only they can generate the contextualized knowledge most crucial to policy-makers in their objective of promoting inclusive development, and because they are crucial to promoting ownership of proposed innovations.” Jacquet played a key role in shaping the study as a follow up to a discussion with JICA on sustainable growth at the sidelines of GDN’s 2015 Global Development Conference in Accra, Ghana. Naohiro Kitano, Director of the JICA Research Institute said, “After years of experience with Kaizen across the world, it will be good to know how it works to improve quality and productivity and to effectively achieve inclusive, innovative and sustainable growth, and in what circumstances.” The JICA research institute creates opportunities for dialogue between researchers and practitioners so that ground-breaking research findings can be delivered to the international community. It supports researchers with financial resources, global networking, and access to information, training, peer review and mentoring. GDN acts on the premise that better research leads to more informed policies and better, more inclusive development. Through its global platform, GDN connects social science researchers with policymakers and development stakeholders across the world. Founded in 1999, GDN is currently headquartered in New Delhi with an office in Washington DC.